Best cigar of the year rankings are always anticipated. They create discussions, thoughts and sometimes anger. I like reading about them but most of the time have not smoked the majority of the cigars in the rankings. Cigar Aficionado magazine, the mostly well respected publication, put Rocky Patel’s sun grown maduro in the number 2 slot in 2016. Maduro cigars are not my favorites but I do appreciate a well made cigar regardless how the blend is formulated. Rocky Patel cigars are for some the pinnacle of cigar making. For others they are the Walmart of smokes. Plenty choices but of dubious quality. 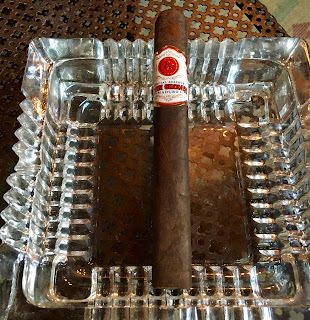 Here is my thoughts on the 2016 #2 ranked cigar from CA. It’s a toro smoke and not the robusto shape that were reviewed by Cigar Aficionado. Almost a flawless cigar with a dark chocolate wrapper, box pressed and an oily touch. There are several large veins showing but totally not an issue. The cigar band completed the smoke giving it a very luscious look. The construction was outstanding. Initial foray was a very choice chocolate flavor with a hint of black spice in the mix. Also some notes of vanilla as we progress through the first third. The flavor was consistent with a medium strength profile no harsh or bitter hints as some maduro smokes get. The burn was straight, cool with a pleasing to the eye grey ash. No problems with uneven patterns. Smoke continued to be faithful with the chocolate flavor. This is a dynamite cigar with all aspects that makes the Rocky Patel Sungrown Maduro a world class cigar. 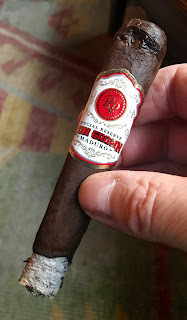 The Rocky Patel brand has been an enigma to me as they can produce such a fabulous smoke and also make run of the mill smokes. I understand manufacturers need to appeal to all price points and tastes but I hope Rocky keeps aiming for a higher plane. Here is the number breakdown. This is a total winner from Rocky and suggest go out a buy a assortment of all sizes.